Middle School at MCS is an exciting place — one where students experience new challenges at more demanding levels, leaving the Middle School well prepared as ambitious, creative and responsible learners. 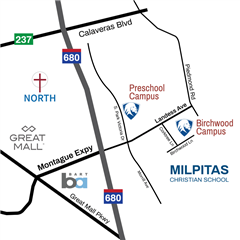 Milpitas Christian School’s Middle School Program for 6th through 8th grades offers students the flexibility to personalize their curriculum. Our curriculum goes beyond remembering facts and understanding context. By providing a framework to develop higher-order thinking skills (analyzing, evaluating, synthesizing information), students can reach a position, make a decision or support their belief. Extracurricular programs include competitive athletics and performing arts. Outdoor Education offers a focus on earth science (Sausalito for 6th grade), life science plus community service (Scotts Valley for 7th grade) and leadership (Washington, D.C. and Hume Lake for 8th grade). Graduating eighth graders have a smooth transition into elite private high schools and rigorous public high schools. Let us share with you how educating the whole child with a Christ-centered focus can make all the difference for your child. As a lifer alumni, former employee and now as a parent I can truly say MCS is the very best and there is no other pre-8th grade school I would want my children to attend. Loving family like environment that nurtures creativity and sets standards high. Builds the foundations for a love of Christ that is sure to stay with them into adulthood. Outstanding school, academics and the best caring teacher I have ever seen. I feel blessed to have my daughter study here. I would highly recommend this school. Absolutely one of the best!! All three of our children attended MCS from pre-school through 8th grade. 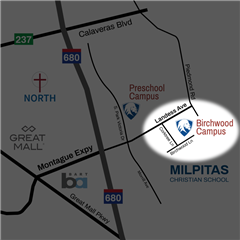 The educational and spiritual foundation they received there prepared them for secondary school at Archbishop Mitty High School and later for college where all three graduated in four years. MCS made a huge, positive impact on our children and our family. "Overall, I'm very satisfied with the school's effort to guide my child in a manner that characterizes him as a follower of Christ. The emphasis on holistic education is very much appreciated." "My child is enjoying his first grade class very much. We are happy to see him grow in different areas." "My child's teacher is a great teacher. She's intuitive to my daughter's individual needs and is willing to work with her and grow her to achieve better results." "Rigorous academic standards built discipline. Attention through small classes and grade size built confidence and focused on needs." "MCS helped teach my child skills that would become useful in high school, such as critical thinking and reading, good study habits, group work, public speaking and writing analytical essays." "MCS provided the basics and foundations for my daughter to succeed in high school. She has her values set so that any challenges and roadblocks coming her way will be treated as opportunities to improve and she will be successful in whatever endeavor she pursues in the future."